Before you head out to celebrate the Thanksgiving holiday with family and friends, why not take a moment to say “thanks” to a Southern colleague by nominating them for the 2016 Superior Service Award! During next month’s Staff Appreciation and Years of Service Brunch, the Superior Service Award will be presented to one Professional Staff and one Classified Staff member who diligently works to show RESPECT TO THE CAMPUS COMMUNITY including our students, personnel and facilities; exhibits a POSITIVE ATTITUDE in what they say and how they act; ensures PRIDE IN THEIR WORK by always doing their best; shows EXEMPLARY DEPENDABILITY in following through on requests and tasks; and provides EXCELLENCE IN CUSTOMER SERVICE, both in person and online. Award recipients are nominated by their peers and must reflect each of the five pads of the Lion Paw. 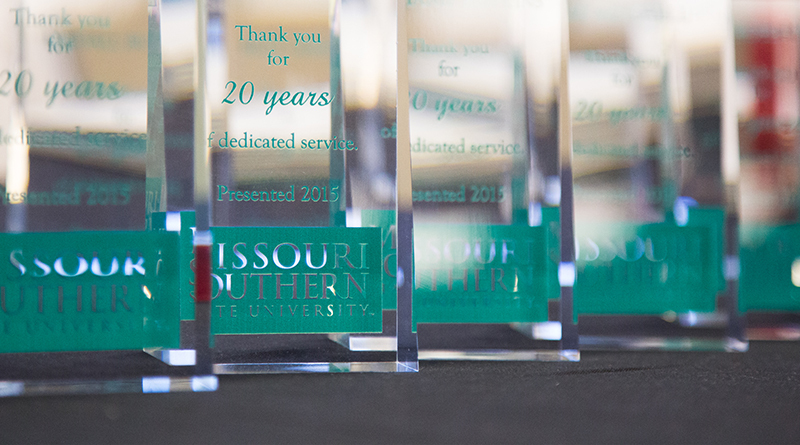 All nominees will be acknowledged at the brunch, with the 2016 Superior Service Award recipients receiving an engraved plaque and $750 cash award made possible by the Missouri Southern Foundation. Superior Service Award nominations may be submitted online using the 2016 MSSU Superior Service Award Nomination Form or printed forms can be picked-up and dropped-off at the Human Resources office. Deadline to submit nominees is Wednesday, Nov. 30.